Congratulations to John O’Malley (captain), Seamus Ellis, Jason Campbell and Mark Gallagher who part of the Donegal Vocational Schools team that beat Monaghan in the Ulster Final last Wednesday night in Kildress. They now play Meath in the All Ireland semi final this Saturday in Ballyconnell at 2pm. 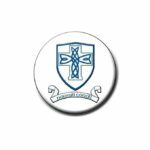 Well done to the Glenties Comprehensive U14 team who defeated Inver College, Carrickmacross last Thursday in the Ulster Schools quarter final. They now play St Ciarans, Ballygawley in the semi final this Friday in Castlederg at 11.30am or 12 noon. Anyone travelling to the game should however confirm details before hand. The club held a very sucessful Annual Presentation Dinner Dance last Saturday night in the Highlands Hotel. Special Guests on the night were Aoife Mc Donald, Cathal Corey, Tony Scuillion and Sean Conoughton Co Board Youth Officer. Medals were presented on the night to our victorious Senior and U21 championship winning teams and our senior ladies team winners of the Junior Gaeltacht. Award winners on the night were Senior Player of the Year went to Anthony Thompson, Most Improved Player Martin Regan, Reserve Player of the Year Hughie Gallagher, Third Team Player of the Year Philip Gallagher and Hugh Breslin. Ladies Player of the Year winner was Emily Thompson and Most Improved Ladies Player was Laoise Ward. Presentataions were also made to John O’Malley, Seamus Ellis, Jason Campbell and Mark Gallagher who were members of the Donegal Vocational Schools team that won the Ulster Final last week and presentations were also made to Leo Mc Loone, Dermot Molloy, Ciaran Boyle and Seamus Corcoran who were part of the Donegal U21 team that won the Ulster championship. There will be a first aid course in the clubhouse this Friday from 6pm to 10pm and on Saturday and Sunday from 9.30pm to 4.30pm. The cost of the course is 75 Euro and there is a limited places left anyone interested can contact Roseleen Doherty. The AGM will be on Sunday 27th Feb in the clubhouse at 6pm. 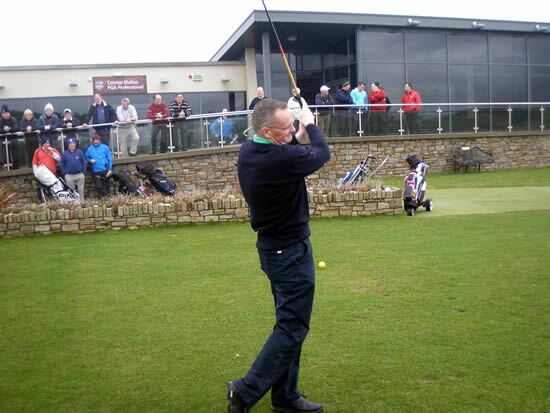 Brian McGonagle, new Club Captain for 2011, drives off at Narin and Portnoo Golf Club. Club president, Bart Whelan, Lady president, Anne Hayden, Lady captain, Bernie Tonry and Captain, Brian McGonagle at the Captain’s drive-in at Narin and Portnoo Golf Club on Saturday last. A large crowd gathered for the Captains’ Drive-in last Saturday to help officially launch the captaincies of Brian McGonagle and Bernie Tonry. The weather was very kind considering the gales of the previous week. Both golfers struck mighty drives, with no hint of nerves or trepidation. The ensuing scramble was won by Seamus McDonagh, Michael Naughton, Sean Connaughton and Joseph McLoone with 50.3 over 16 holes. The proceeds of the day were accepted by Mrs. Stephanie McNelis on behalf of the Donegal Hospice. Sunday’s competition saw the aforementioned Joseph McLoone double up over the weekend, winning the stableford by a large margin. His score of 41 points was the only one to better par on the day, a magnificent achievement! Charlie Tully was second, six shots back, while John Bán Gallagher took third with 34 on a break-off-tie. 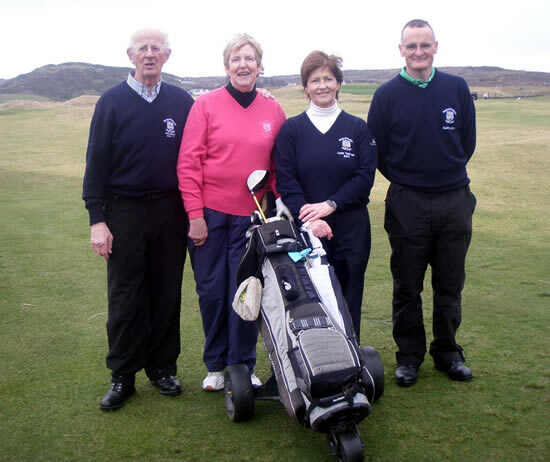 The Spring Foursomes 2010 was won by the pairing of Anthony Harkin and Patsy Harkin following their comfortable victory over Donie McCole and Charlie Bryson last Sunday. Both pairings had won thrilling tussles en route to the final and the quality of golf played last Sunday was a tribute to them all. The Rosbeg natives had too much in the locker on the day, however, and Charlie and Donie could have no complaints. February 5: Drive-in: 1. Seamus McDonagh, Michael Naughton, Sean Connaughton and Joseph McLoone 50.3; 2. Patsy Harkin, Anthony Harkin, Lyle Taggart, Willie Quinn; 3. Nan Quinn, Joan Quinn, John Quinn, Noel Quinn; February 6: Club Open 1. Joseph McLoone (11) 41; 2. Charlie Tully (10) 35; 3. 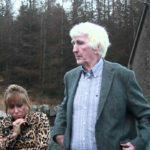 John Bán Gallagher (11) 34 b.o.t.